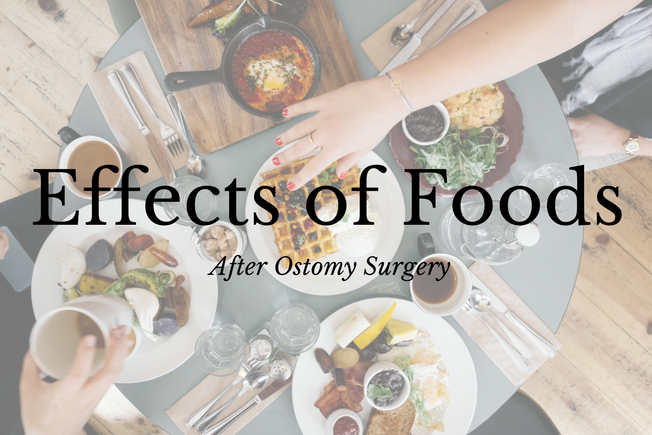 Life after surgery requires adapting to effects of foods. Use trial and error to determine your individual tolerance. Do not be afraid to try foods that you like, just try small amounts. Here are 5 tips for foods after Ostomy surgery! Foods with a high level of food dyes will change the color of your stool. Just think about this and what you may have eaten that may have affected the color of your stool. For example if you drink a cherry ice your stool WILL be red. But do not panic, you are not bleeding to death so do not call 911. Go easy at the Saturday night bar as increased levels of alcohol will cause increased stool output. To relieve or ease bloating or backed up pipes, try lots of warm liquids, or hot toddy (alcohol increases stool production) But is you are a teetotaler , try cooked fruit or fruit juice. Not looking for the hot air balloon syndrome, stay away from beans, cabbage, cauliflower, carbonated beverages, and chewing gum. These items will cause gas production. PS Straws are not your friend. For a sweeter smelling pouch try parsley, yogurt, cranberry juice. These helps to sweeten the deal or pouch.